It was around 11a.m. on the 18th September 1970, that Jimi Hendrix was found unresponsive at an apartment in the Samarkand Hotel, in Notting Hill, London. He was rushed to the St. Mary’s Abbot’s Hospital, but pronounced dead at 12.45p.m. Jimi Hendrix was just twenty-seven. Music had lost one of the most influential and innovative guitarists of his generation. That’s despite Jimi’s solo career beginning just four years earlier. Since then, Jimi had released a trio of studio album and one live album. However, since Jimi’s death, twelve posthumous albums have been released. The first of these were The Cry Of Love and Rainbow Bridge. Both albums were released back in 1971. Remastered versions of The Cry Of Love and Rainbow Bridge have been recently released by Sony Music. These albums are a remainder of a musical maverick at the peak of his powers. It was T-Bone who Jimi saw playing his guitar with his teeth. When Jimi saw this, he took it as a challenge. This became part of Jimi’s routine. In years to come, Jimi played his guitar as if his life depended upon it. Jimi, on form, was like a man possessed. Some nights, Jimi played his guitar behind his back, played it with his teeth and as if trying to exercise some inner demons, set his guitar on fire. All this made Jimi one of the most exiting guitarists ever. However, Jimi was also a technically brilliant guitarists of his generation. That was apparent from his debut album with The Jimi Hendrix Experience. 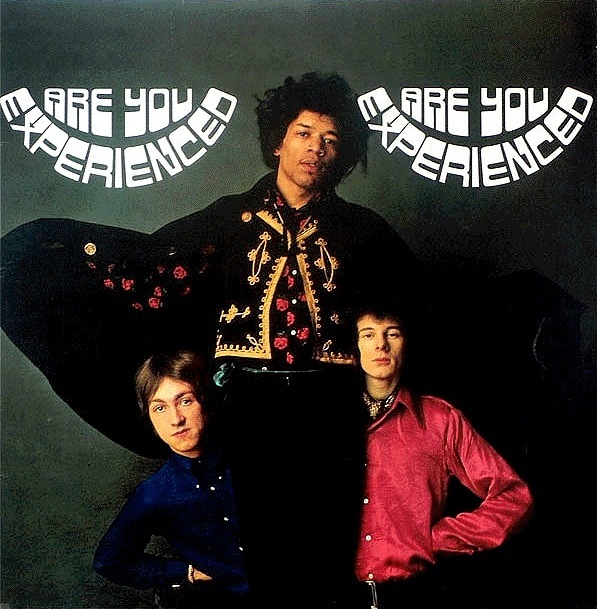 That was apparent from The Jimi Hendrix’s 1967 debut album Are You Experienced. It featured the debut of the legendary power trio The Jimi Hendrix Experience. It featured drummer Mitch Mitchell, bassist Noel Redding and guitarist Jimi Hendrix. They fused rock and psychedelia on eleven tracks penned by Jimi Hendrix. Recording of Axis: Bold As Love took place at Olympic Studios, London. The sessions took place during May, June and October 1967. Axis: Bold As Love had to be released during 1967. The contract that the Jimi Hendrix Experience had signed stipulated this. Ironically, the album was nearly lost. One night, Jimi Hendrix took the master tapes to side one home. Unfortunately, Jimi left them in a taxi. The master tapes were never found. This resulted in side one being mixed again. This didn’t delay the release of Axis: Bold As Love. 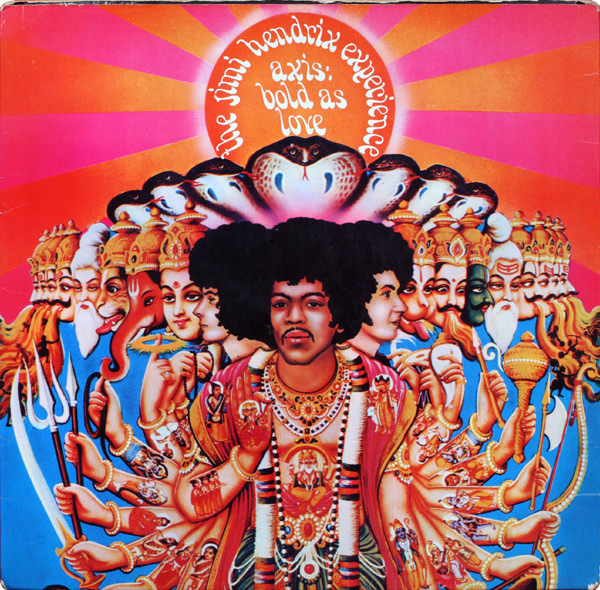 As planned, Axis: Bold As Love was released in Britain in December 1967. Unlike The Jimi Hendrix Experience’s two previous albums, Electric Ladyland was an ambitious album. It featured sixteen songs. Thirteen songs were penned by Jimi. Two of the covers were Bob Dylan’s All Around The Watchtower and Earl King’s Come On (Let the Good Times Roll. These tracks, and the rest of Electric Ladyland were recorded at three recording studios. 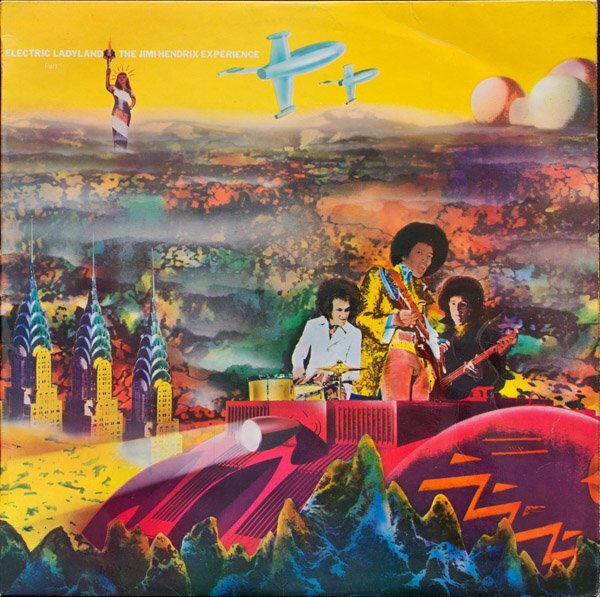 As soon as critics heard Electric Ladyland, they realised that this was The Jimi Hendrix Experience’s best album. It oozed quality. Tracks like Crosstown Traffic, Voodoo Chile, Voodoo Child (Slight Return), All Along the Watchtower and Gypsy resulted in what was the greatest album of The Jimi Hendrix Experience’s career. Critics hailed Electric Ladyland a career high for The Jimi Hendrix Experience. Record buyers agreed. 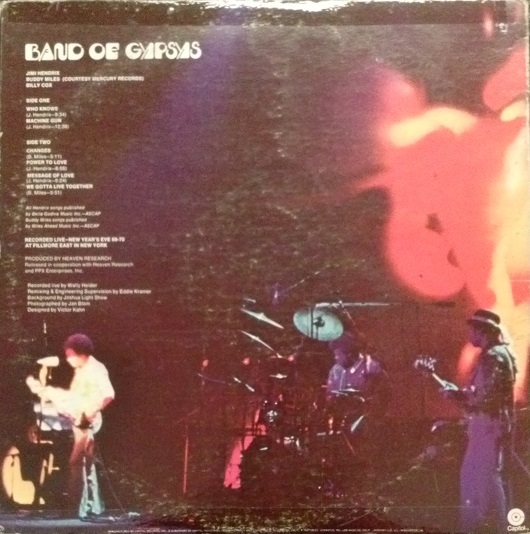 Band Of Gypsys was released in Britain on 25th March 1970. It reached number six. Nearly three months later, on June 12th 1970, Band Of Gypsys was released in America, reaching number five in the US Billboard 200. This resulted in Band Of Gypsys being certified double platinum. Jimi Hendrix it seemed could do no wrong. Everyone waited with baited breath to see what direction his career headed. Sadly, tragedy struck. The Cry of Love was the album that Jimi Hendrix was working on, at the time of his death. It was meant to be Jimi’s debut solo album. Sadly, fate intervened and The Cry of Love, was never released during his lifetime. Jimi had been working on The Cry of Love since The Jimi Hendrix Experience split-up. He’d been working with drummer Mitch Mitchell and bassist Billy Cox on The Cry Of Love. It featured ten tracks which were penned by Jimi. These tracks were recorded at Jimi’s new Electric Lady Studios, in New York. At Electric Lady, Jimi, Mitch Mitchell and Billy Cox had recorded the ten songs. Around half the songs were completed. The rest of the songs, were in various states of completion. In some cases, the tracks were work in progress. Other tracks required overdubbing. So, when Jimi died, recording engineer Eddie Kramer and Mitch Mitchell got to work. They were joined by Jimi’s manager, Michael Jeffrey. Together, they got to work on completing Jimi’s first posthumous album, The Cry of Love. Commercial reality dictated that The Cry of Love had to be finished, and finished quickly. After all, interest in Jimi Hendrix’s music was at an all-time high. However, they had to be careful that The Cry of Love wasn’t perceived as a hastily compiled, cash-in. That was never going to be the case. Everyone involved saw The Cry of Love as a homage to Jimi Hendrix. Time, care and attention was taken compiling The Cry of Love. Before The Cry of Love, was completed, some overdubbing had to be carried out. Some new parts had to be added. 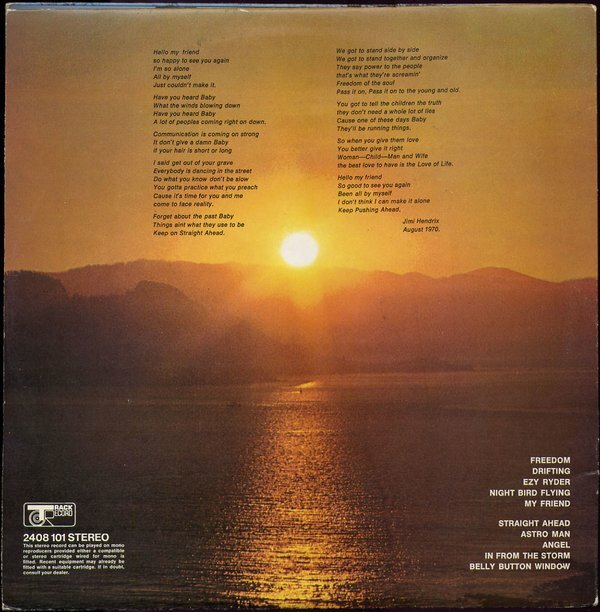 Recording engineer Eddie Kramer and Mitch Mitchell were asked to coproduce The Cry Of Love. They mixed the tracks, albeit with some guidance from Eddie Kramer, Jimi’s manager. He and Mitch Mitchell were given then given the job of deciding the final track listing. Only then, was The Cry Of Love completed and ready for release. When The Cry Of Love was released on 5th March 1971, less than six months after Jimi’s death, mostly, the reviews were critically acclaimed. A few contrarian reviews disagreed. This included the Rolling Stone magazine. It’s review was merely favourable. However, most critics realised, that if Jimi Hendrix had lived, The Cry Of Love would’ve been a trailblazing debut. So did record buyers. On the release of The Cry Of Love, it reached number two in Britain. However, The Cry Of Love fared much better in America. It reached number three and was certified platinum. This equated to over one million sales. Six months after his death, Jimi Hendrix was one of the most successful and innovative musicians of his generation. However, many people thought that The Cry Of Love was the last they’d hear from Jimi Hendrix. That wasn’t the case. Seven months after the release of The Cry Of Love, the second posthumous Jimi Hendrix album was released. This was Rainbow Bridge. Just like The Cry Of Love, Rainbow Bridge consisted of recordings made after The Jimi Hendrix Experience split-up. The eight tracks on Rainbow Concert were recorded during 1969 and 1970. 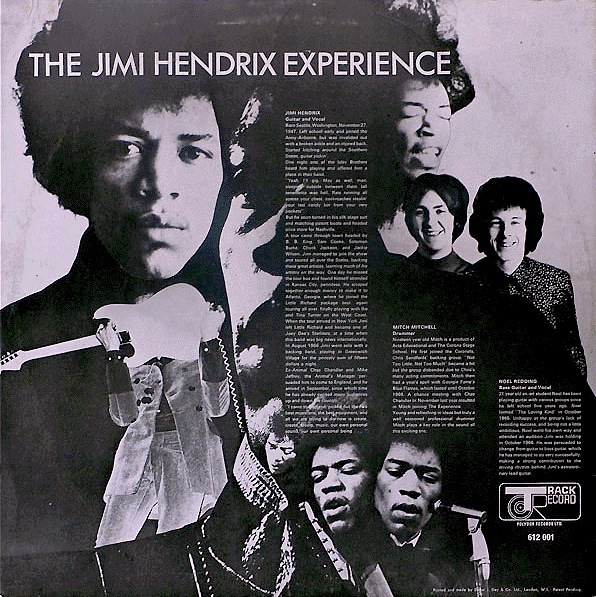 Seven track were written by Jimi. They recorded with various musicians at various studios, including the Record Plant and Electric Lady Studios in New York. Way Over Yonder was recorded at TTG Studios, in Hollywood, Los Angeles. The other track, Hear My Train A Comin’ was recorded live at Berkeley Community Theatre, Berkeley, California. Just like the rest of the tracks, it featured some of Jimi’s musical friends. This included Noel Redding and Mitch Mitchell of The Jimi Hendrix Experience. They’re joined by the Band Of Gypsys. Drummer Buddy Miles and bassist Billy Cox all feature on Rainbow Concert. So do The Ronettes, who add backing vocals on Rainbow Bridge. It’s one of eight tracks that showcase Jimi Hendrix evolving as a singer, songwriter and guitarist. That’s also the case with an early version of Star Spangled Banner. 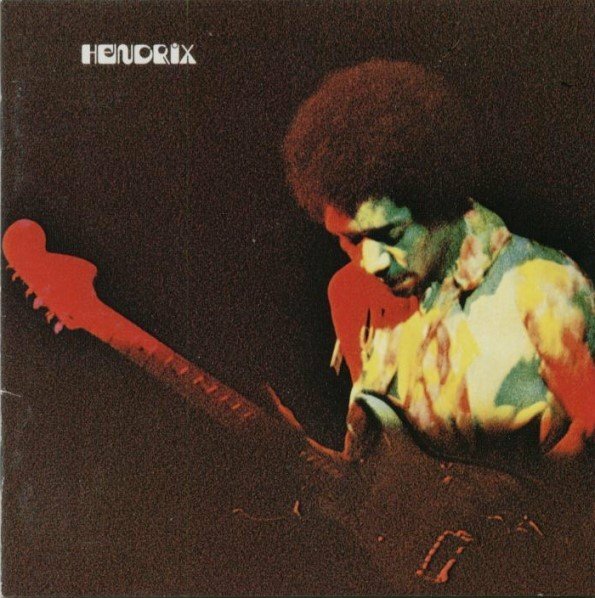 It sees Band Of Gypsys’ bassist Billy Cox joins Jimi Hendrix Experience drummer Mitch Mitchell. They play their part of a captivating version of what became a Jimi Hendrix classic. 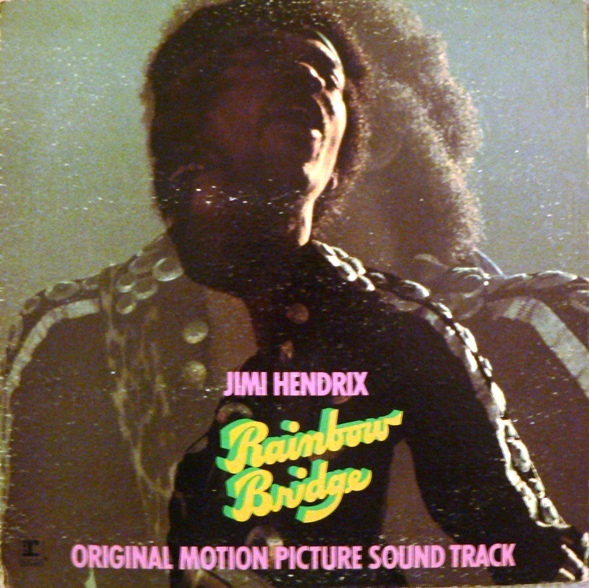 Other future Jimi Hendrix classics include Dolly Dagger and what’s regarded as the definitive version of Hear My Train A Comin.’ These are just three reasons why Rainbow Bridge was such a commercial success. Rainbow Bridge was released in November 1971. It was well received by critics. They remarked upon how Jimi was maturing as a musician, singer and songwriter on Rainbow Bridge. Sadly, Rainbow Bridge wasn’t as successful as previous albums. It stalled at number sixteen in Britain and number fifteen in the US Billboard 200. However, at least Rainbow Bridge was certified gold in America, where Jimi was still regarded as one of the greatest musicians in the history of rock music. That’s still the case. Forty-three years after the release of The Cry Of Love and Rainbow Bridge, which were recently rereleased by Sony Music, Jimi Hendrix is still regarded as one of the greatest musicians in the history of modern music. He was a freewheeling, flamboyant, musical maverick, who did things his way. This included playing his guitar with his teeth. When Jimi saw T-Bone Walker do this, he took it as a challenge. Soon, it became part of Jimi’s routine. Since then, Jimi’s discography has grown. 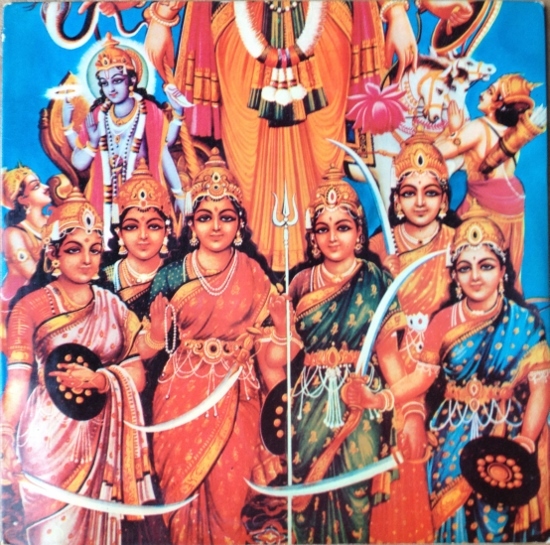 Twelve further albums have been released. The first of these albums were The Cry Of Love and Rainbow Bridge, which were recently reissued remastered by Sony Music. They feature Jimi Hendrix as he matured as a singer, songwriter and musicians. Goodness knows what kind of musical colossus he might have become, had he cheated death? He may have continued to have been one of the most innovative and influential musicians of his generation. Sadly, that’s speculation. What we do know, is that Jimi Hendrix leaves behind a rich musical legacy. This started with the trio of albums Jimi released with The Jimi Hendrix Experience. Are You Experienced, Axis: Bold As Love and Electric Ladyland are stonewall classics that belong in any self-respecting record collection. 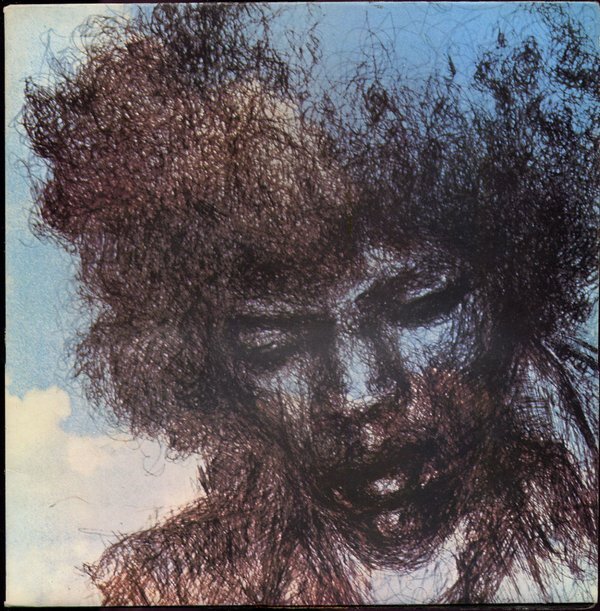 Band Of Gypsys, Jimi’s first album after the breakup of The Jimi Hendrix Experience, sees him changing direction musically. This continues on The Cry Of Love and Rainbow Bridge, where Jimi Hendrix matures and evolves as a musician. The Cry Of Love and Rainbow Bridge are a tantalising taste of the direction Jimi Hendrix’s music was heading. Who knows what heights Jimi may have scaled, if he’d lived? Sadly, we’ll never know. What we do know, is that Jimi Hendrix left behind one of the richest musical legacies, which showcases a flamboyant, musical maverick at the peak of his powers. 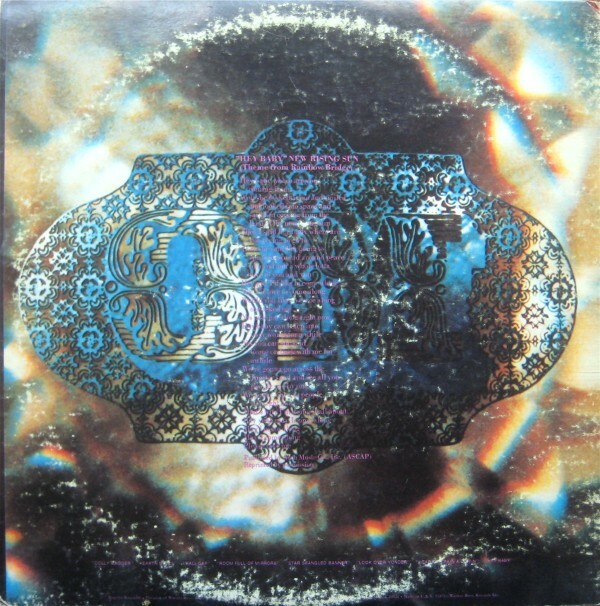 ← LED ZEPPELIN-HOUSES OF THE HOLY.